Hosting this year? Major jobs like cleaning, shopping, prepping, and cooking leave little time and energy for décor. But don’t despair – a simple centerpiece can go a long way, and it doesn’t have to be elaborate. 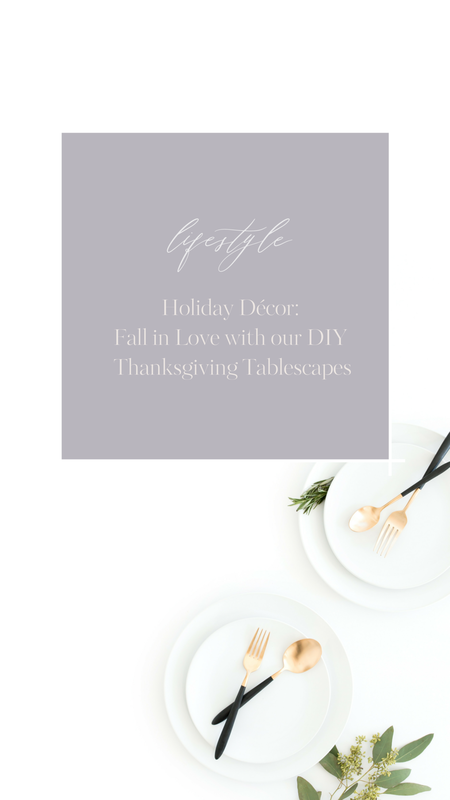 Thanksgiving might be all about bounty and abundance, but that doesn’t have to be the case with décor! 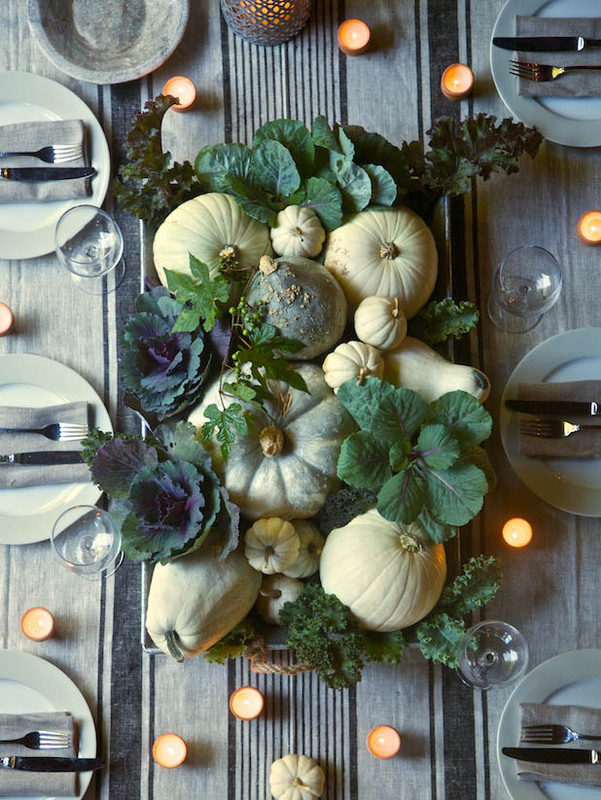 Read on for our simple fall tablescape ideas. Fresh produce presented in a tray make for a striking autumn centerpiece. Using a tray as a base, arrange pumpkin gourds as tight as possible. From there, simply position kales, cabbages, succulents and assorted greenery in all the empty spaces between! Echoing the Daily Basics blog, add tea lights to the surrounding area. Pick the ripest, prettiest pears at the market and arrange them on your favourite platter. Cut out paper leaves and have each family member write their name and something they’re thankful for on the back. Voila – family bonding and table ornamentation all in one. White pumpkins are timeless, but very trendy when combined with stylish décor elements like faux antlers and tea lights. As featured in the blog, “Tone on Tone,” add some dried hydrangeas or baby’s breath for extra texture. Look no further than your backyard if you feel like adding leaves, pine cones or twigs! Anything that combines food with design is always in good taste! Using a piece of wood as a base, position greenery and dried barley or wheat around candles for a cozy and elegant design. Go the extra mile with grapes, walnuts, chestnuts and cheese! Pumpkins and dried flowers are a superb combination for autumn as featured on the blog A Pumpkin & A Princess. Start by carving a hole in the top of your pumpkin and hollowing out the middle, creating room for your vase. It doesn’t have to be a perfect cut – it won’t be visible once you’ve added your dried barley, cattails and whatever else you have hanging around the house! You may have to hit up the craft store for some dried flowers for your arrangement – whatever foliage you choose will add volume and fill in any gaps. We think this monochromatic piece is beautiful, and would be equally stunning with a touch of greenery and berries or a sunflower. 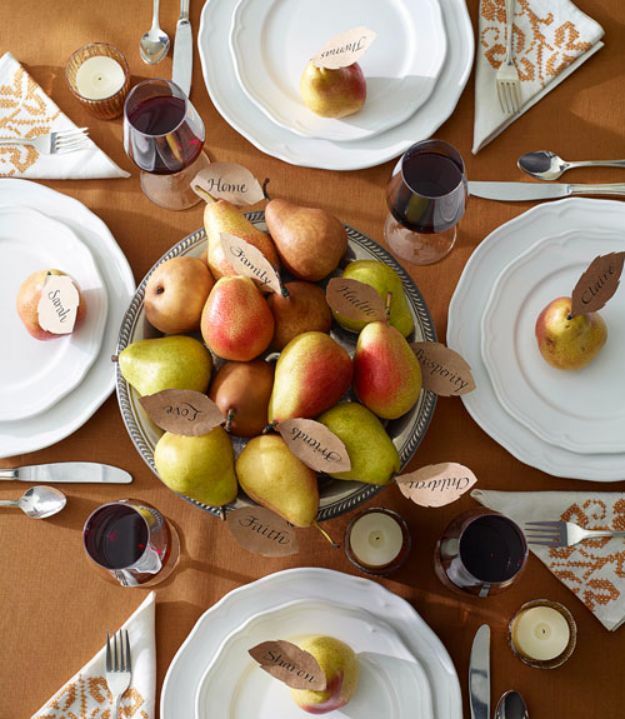 Leave a comment below letting us know how you decorate your tablescape for Thanksgiving dinner. We would love to hear!